Our black hat features a fearsome Headless Horseman ready to hurl a Jack O'Lantern. With pumpkin in orange and headless horseman in white and black thread, this is a very distinctive hat. It's all we can do to keep family and friends from "borrowing" samples. Keep Ichabod Crane out of your fridge or office with this shot of the headless horseman in the churchyard of Sleepy Hollow's Old Dutch Church. 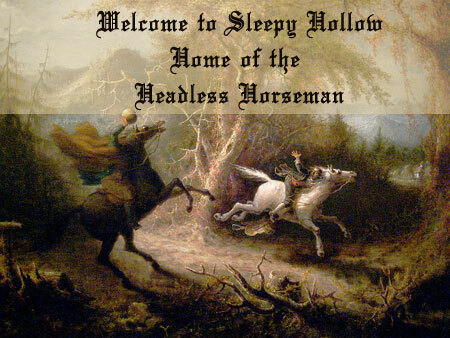 In The Legend of Sleepy Hollow, this is the spot from which the horseman rises each night in search of his head. 2.5" x 3.5" rectangular. Made in USA. Newly arrived and ready for hot chocolate, coffee or a cold beer, our new mug holds 15 ounces of your favorite libation. Mugs come in matte black or glossy black. Back of each mug gives a brief description of our favorite “legend".